Hood River and Mount Hood might be one of the most convenient destinations for people traveling in RVs or car camping. Where can I find a campsite near Hood River? This densely treed park is a super convenient place to camp while exploring the Columbia River Valley, Hood River, and Mount Hood. It is the closest State Park campground to town. The only downfall is the noise. Trains pass directly by the camp at all hours of the day. Location: Very convenient to Hood River, Viento State Park is just 8 miles west of downtown along I-84. Cost: $17-$22/night depending on the type of site and season. Services: There is a nice beach and a few trails that are easily accessed from camp. Flush toilets, showers, running water, and electric sites are available. Cell service is also good. Reservations: First come, first serve only. Call (541)374-8811 for more information. More Oregon State Parks. Located on the Washington side of the Columbia River, Beacon State Park offers a lovely setting for camping and hiking. Location: 10 miles west of Stevenson, Washington along WA-14. Services: Flush toilets, showers, electric sites available. Winter services are limited. Reservations: Make your Reservations Online. This beautiful setting is ideal for visitors who want to spend their days fishing, boating, or hiking. 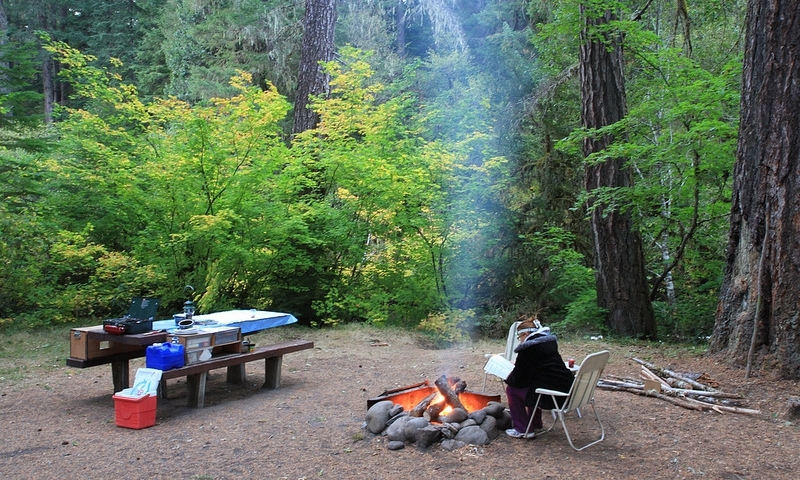 Located right at Trillium Lake, this is one of the most popular campgrounds near Mount Hood. Location: Located in a beautiful setting, right along the banks of Trillium Lake with stunning views of Mount Hood. The nearest town is Government Camp. Services: Vault toilets, drinking water, no electric hook-ups available. Reservations: Call (877) 444 6777 or Reserve Online.